As a designer, I'm a bit of a Pantone nut, as I work with them during the day and it means I'm constantly looking into trending tones and tints. When Pantone announced that Radiant Orchid was to be the colour of 2014, I had to do a little inner dance -- it's the perfect colour for beauty lovers. 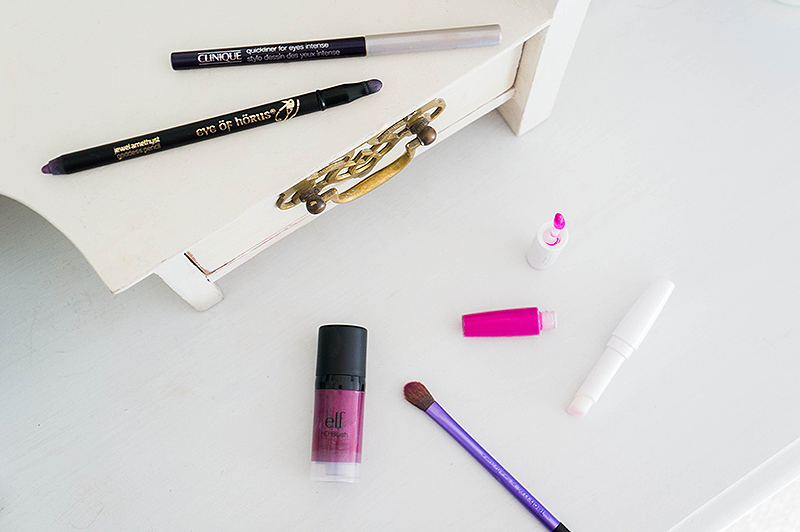 With Spring just around the corner, slotting this flirty purple into your existing makeup routine will be effortless. If eyes are your thing, taking a chance on the Eye of Horus Jewel Amethyst Goddess Eye Pencil*, £13 will change your life. Well maybe not your life, but it will certainly add an extra dimension to the ceaseless neutral palettes and browns that litter most of our eyeshadow collection. Exceptionally pigmented, intensely captivating, flecked with purple micro glitter and soft to the touch. One end holds the rich purple pencil, while the other boasts a smudging sponge that can easily blend the colour out creating the simplest of smokey eyes. It's long lasting, waterproof and doesn't budge when it's set in place. I think it's love! To tightline the lashes, Clinique offer up a gorgeous Quickliner in Intense Plum, £15 that appears black but has a shimmery purple running through the centre. So if you're not feeling too adventurous you can still be on trend if you swap this for your usual black liner. Something I never really expected to buy was a purple blush. And I'm not talking purple/pink, I'm almost terrified when I reach for the tube and remember just how dark it really is. ELF HD Blush in Showstopper, £3.75 is a cream blush that goes a long way, and less is most certainly more. The first time I used it, I put a sizeable pump onto my hand, dipped my brush and commenced to stipple it onto my cheeks. Clown comes to mind, so really work it into the skin and brush off any excess onto some tissue paper before applying. I do love the purple hue that's left behind, and I've even doubled it up as a cream eyeshadow. When it comes to lips, bold is key and nothing is more bold that Maybelline Super Stay 24 Bold Matte in Prune Plaisir, £8.99. A real eye-turner, this lip lacquer dries matte and lasts through the day so you don't have to top up every 5 minutes. Combing a smokey eye with a bold lip isn't for everyone though, so opt for natural eyes with a hint of mascara and apply Topshop Lipstick in Beguiled, £8 a vampy deep purple that never fails to attract compliments. How will you be wearing Radiant Orchid? This look really is so lovely on you!! Love the look, the eyes are gorgeous! I love wearing purple shadow. I have a Soap and Glory kohl pencil in purple and love wearing it along my long and upper lash line and smudging it out a little! 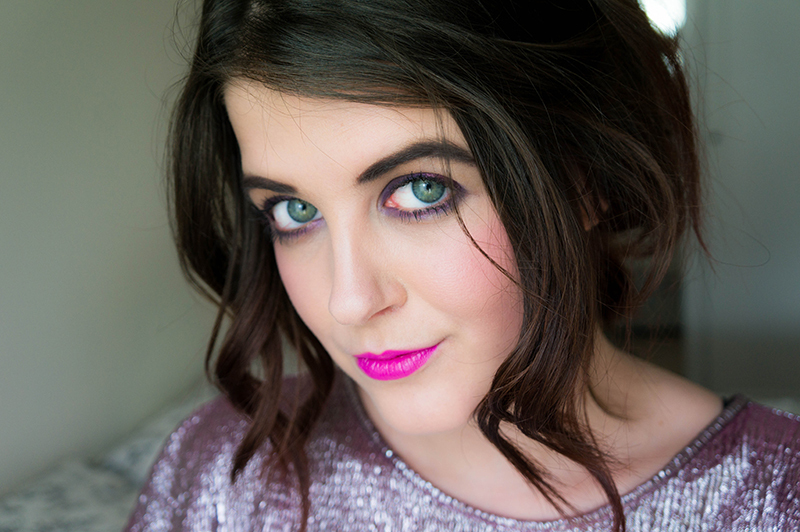 Purple is such a great colour for us with green eyes - and yours look lovely as well! Oh wow, this look suits you so much! What a gorgeous look, Adrienne! I'm always worried about using brighter colours but this is beautiful and might be something I would try. i'm absolutely loving this trend, the Maybelline Color Elixir in Dashing Orchid is my go to look. You look absolutely stunning (and your hair is gorgeous). The lipstick suits you so much! I don't know how I will wear it but I can say you're definitely rocking the shade. I love the color on you! Thank you for including affordable cosmetics into the post! This looks so nice! I would never be able to be pull off such a bold and bright colour though aha :)! that lip laquer is amazing!